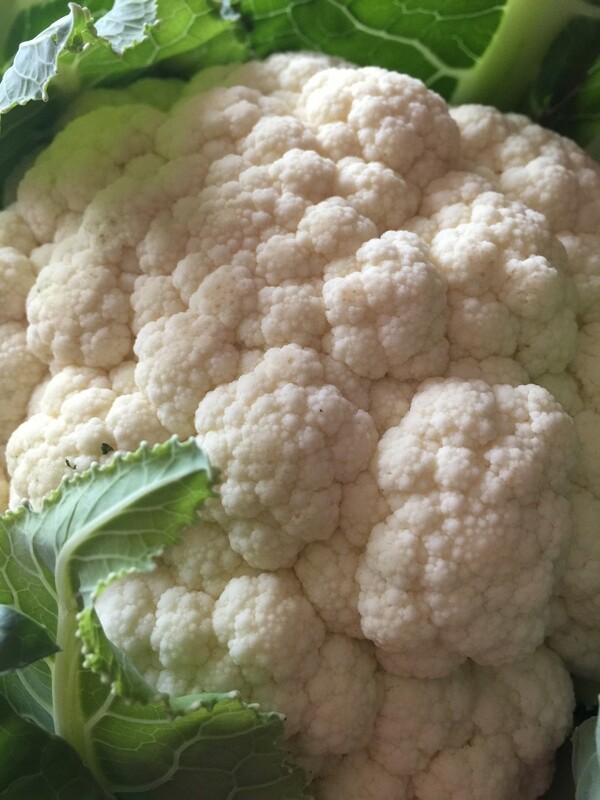 If Not a Cabbage, What Is it? Radicchio is a member of the chicory family, a cousin of endive, and (believe it or not) botanically related to the dandelion. When allowed to flower, the plants produce a beautiful blue blossom. When Did Radicchio Become the "In" Salad Green? I have looked through all of my cookbooks--even 10 years ago radicchio was not spoken of. We jumped from "rack of lamb" to "radish'. So when did radicchio graduate from being a simple Italian-garden vegetable to an upscale restaurant offering? 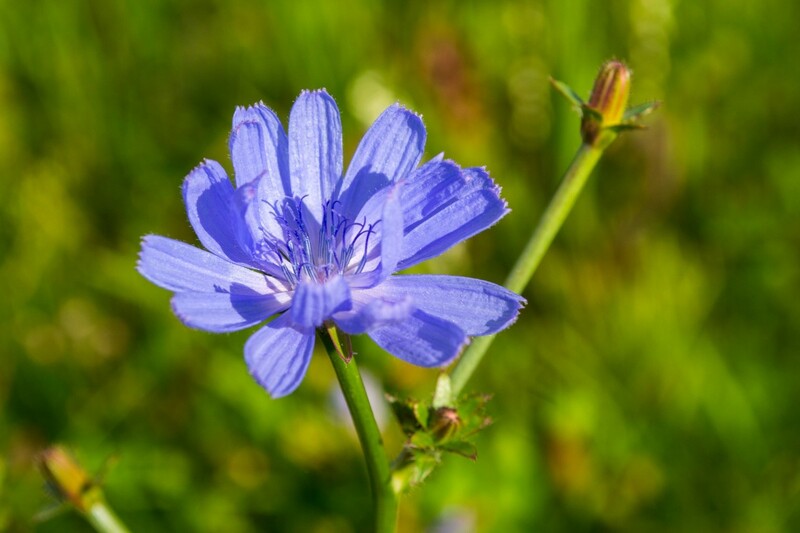 Although this member of the chicory family has been a staple of Northern Italian cooking for centuries, commercial production in the United States did not begin until 1988. Knowledgeable chefs recognized that no other vegetable could replicate the taste, texture, and dramatic color of radicchio but imported radicchio was a costly addition to the dinner plate. Radicchio was recognized in ancient times for its medicinal powers. In Naturalis Historia. Pliny the Elder claimed that it was a blood purifier and could cure insomnia; he believed that it was the Egyptians who had originally tamed radicchio's wild ancestor, the chicory plant. In the Middle Ages monks were happy to include this bit of zing to their otherwise humdrum vegetarian diet. Grow from seed and sow directly into soil or start seedlings indoors. Infrequent watering will produce a bitter tasting leaf. Water frequently, but not deeply. 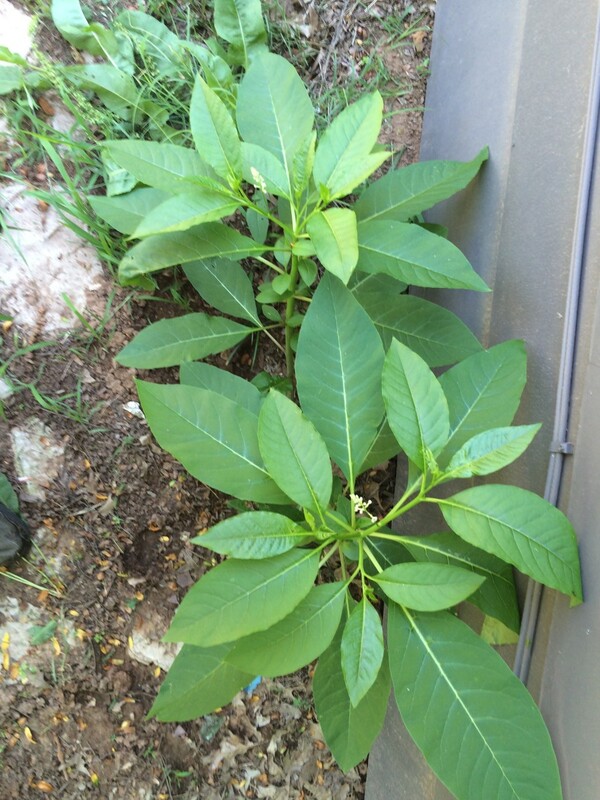 Look for firm, compact heads without wilted or yellowed leaves. Store radicchio unwashed in the coldest section of the refrigerator. Do not wrap or cover. The most popular, Chioggia, is round in shape and stores well for weeks in your refrigerator. Treviso radicchio is shaped more like it's endive cousin--long and slim. It should be used within one week of purchase. Although available year-round, summer radicchio tends to be more bitter. Cool-weather radicchio purchases will be less assertive. There is a love-hate relationship with radicchio; distained by those who tried it once and abhor the bitter taste, but adored by those who were fortunate enough to have a gentler introduction. Raw radicchio is a bold, somewhat assertive bitter green, but cook it gently and it caramelizes, melting into sweet, creamy, tastebud-tantalizing bliss. Radicchio is first a salad green, but bear in mind that a little goes a long ways. In a leafy salad, radicchio should provide a pop of color and a burst of flavor, but I would not make it the main event. Pair it with peppery arugula or perhaps some baby spinach. Toss in a few dried currants and slices of bosc pear, top with crumbled Gorgonzola and drizzle with a raspberry vinaigrette and (in my humble opinion) you have a salad fit for the gods. But I prefer to take it a step further. As stated above, the bitter flavor of radicchio can not only be mellowed, it can be completely tamed with proper cooking. 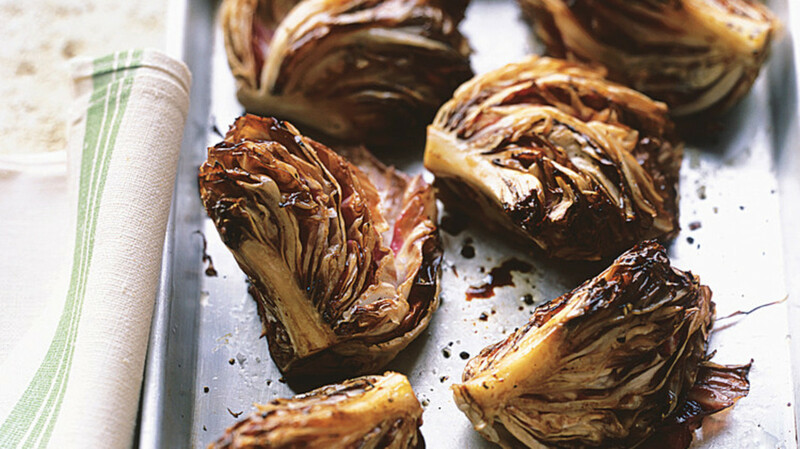 Roasting is the easiest way to cook radicchio and Martha Stewart published a recipe in 2004 that is easy indeed—5 minutes of prep time and 15 minutes to cook. A version of this recipe was printed in Food and Wine magazine; with over 3,000 reviews it had a rating of 5 stars. 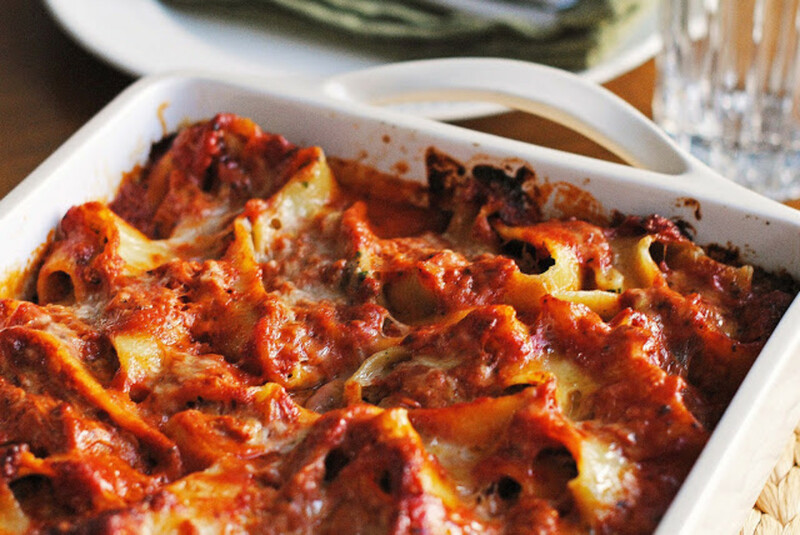 Let's see--pasta, red sauce, ricotta, and fontina cheese? What's not to love? Well, Teri (That's Some Good Cookin') took it one step further. Instead of relying on jarred marinara sauce, she made her own. She cautions "This is a recipe for dinner guests; not for the family dinner table. Please don’t be offended by that statement. This is a pricey little dish and the flavors are more adult in nature. Granted, there are some children with more refined palates, but in general, a good plate of spaghetti will suffice for your offspring." If you have guests that you want to truly impress, create this radicchio-pasta dish for them. This is the salad you use for company, or for a very special dinner-for-two. There are so many amazing flavors going on in this genius salad, I hardly know where to begin. In this recipe chef Anne Burrell pairs radicchio with its cousin the Belgian endive and peppery arugula. Goat cheese is creamy, earthy and a bit funky. 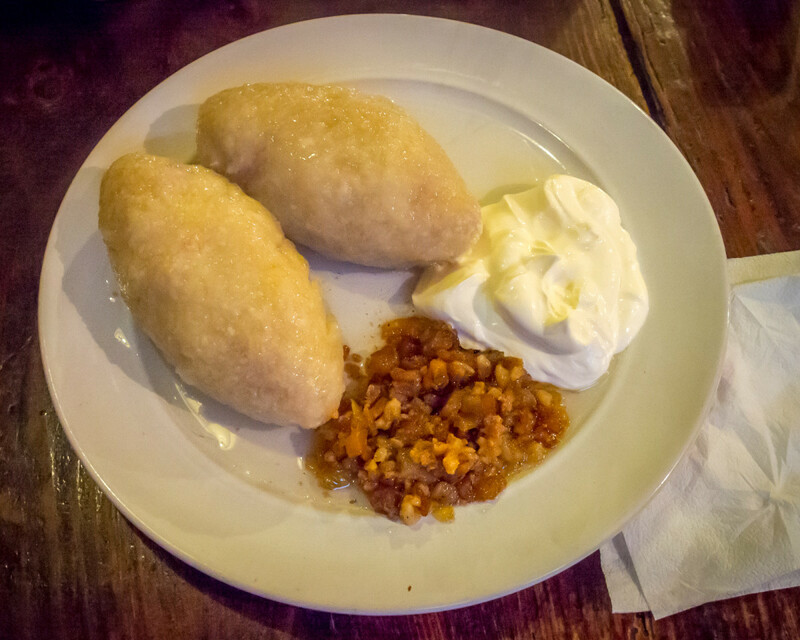 The first time I tasted goat cheese was at the home of my cousin in Slovenia (but that’s another story for another time—suffice it to say that I fell in love). Walnuts provide a contrasting buttery crunch. Sherry vinegar helps create a sweet-tart dressing, the perfect counterpoint to the rich goat cheese. And then, Anne tosses the greens into the warm sherry dressing, giving the vegetables just enough simmer-time in the rich oil-shallot-Dijon-vinegar bath to render them supple and succulent. 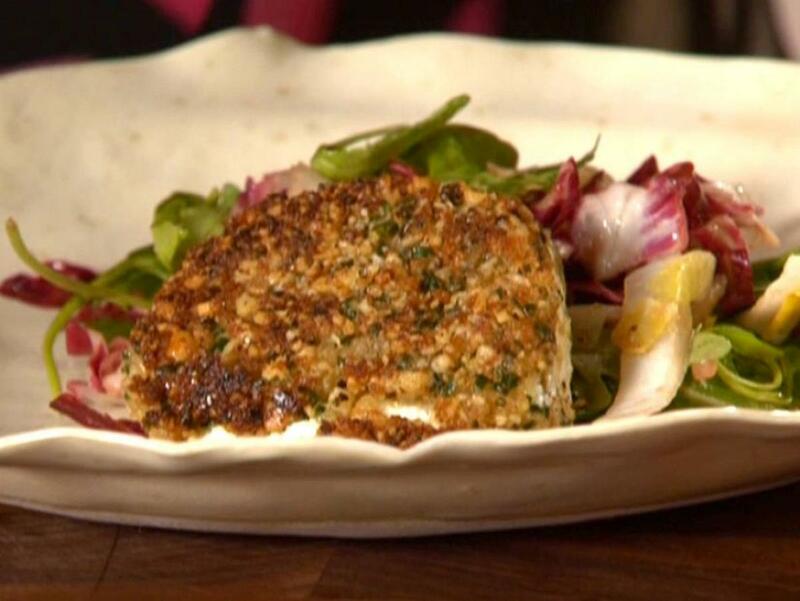 I created this dish for my family; it is excellent with roast chicken or salmon. 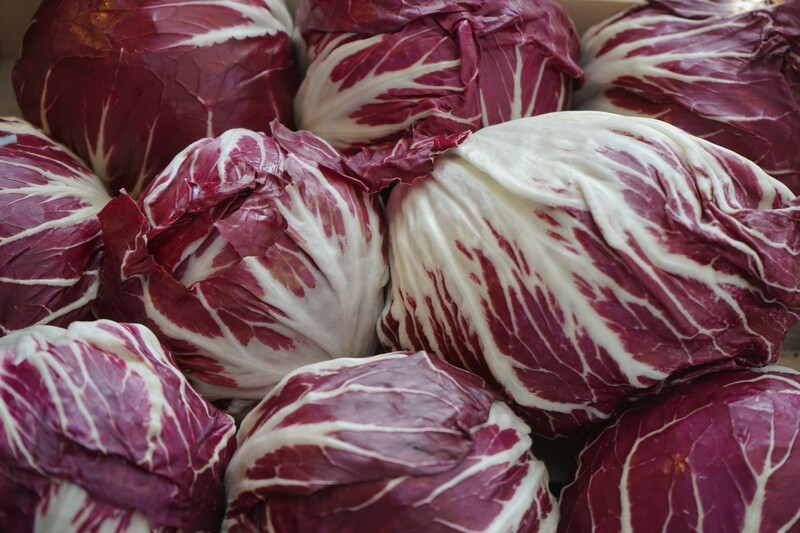 Don't expect the radicchio to retain it's bold purple-red color when cooked. I suggest soaking the radicchio to tame some of the bitterness. Remove outer leaves from radicchio. Cut in half from root end to tip and place in an large bowl filled with ice water. Allow to soak for at least 20 minutes and up to one hour. This will help remove some of the natural bitterness from the radicchio. After soaking the radicchio, drain it well, chop finely, blot dry, and set aside. In large frying pan melt 1 tablespoon butter with olive oil over medium heat. Add onion and garlic and cook until onion is soft, about 2 minutes. Add the radicchio. Cook until lightly browned (3 to 4 minutes). Stir in thyme. Add 1/4 cup of the wine and cook until wine is absorbed. Remove from heat and cover to keep warm. Melt remaining 1 tablespoon butter in a large heavy saucepan over medium heat. Add rice, pepper, and remaining 1/2 cup white wine. Stir to insure that rice does not clump together and cook until wine is absorbed. Add 1 cup broth, reduce heat to low, and stir until broth is almost absorbed. Continue to add broth, 1/2 cup at a time and stirring until rice is creamy and tender but still firm in center. This should take about 15 to 18 minutes. Remove from heat and stir in Parmigiano-Reggiano and mascarpone cheese. It's all about the rice. 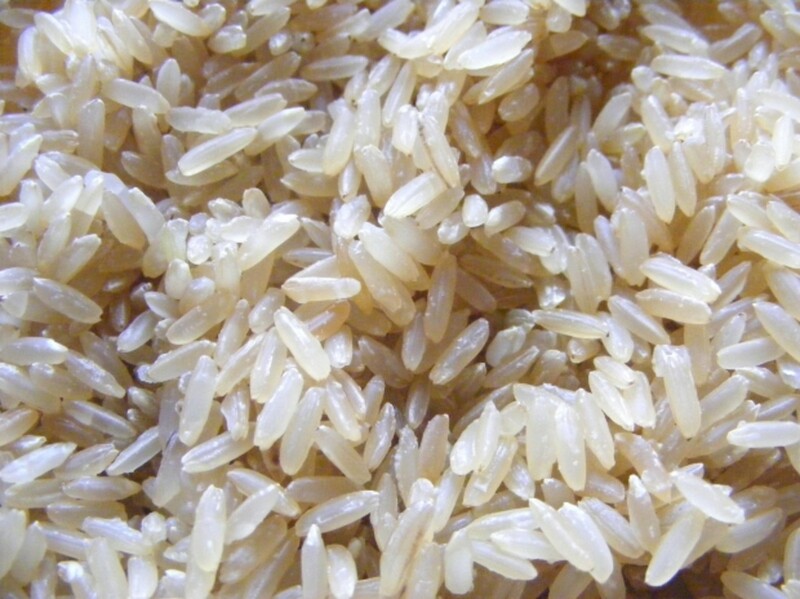 Aborio rice is an Italian short-grain rice named after the town in the Po Valley in which it is grown. Please don't try to cook risotto with long-grain, medium-grain, or (worst case scenario) instant rice. It simply will NOT work. Varieties of rice are roughly grouped into three distinct categories--long grain, medium grain, or short grain. Long-grain rice is about four times as long as wide, medium grain is twice as long, and short-grain is almost round. However shape is not what makes these rices perform differently when cooked. What matters is the amounts of amylose and amylopectin starch. Amylose starch does not break down when heated, but amylopectin does. Rice high in amylose stays fluffy, with distinct individual grains (unless you overcook it). On the other hand, rice high in amylopectin (which is gelatinous) becomes starchy or "sticky" when cooked. 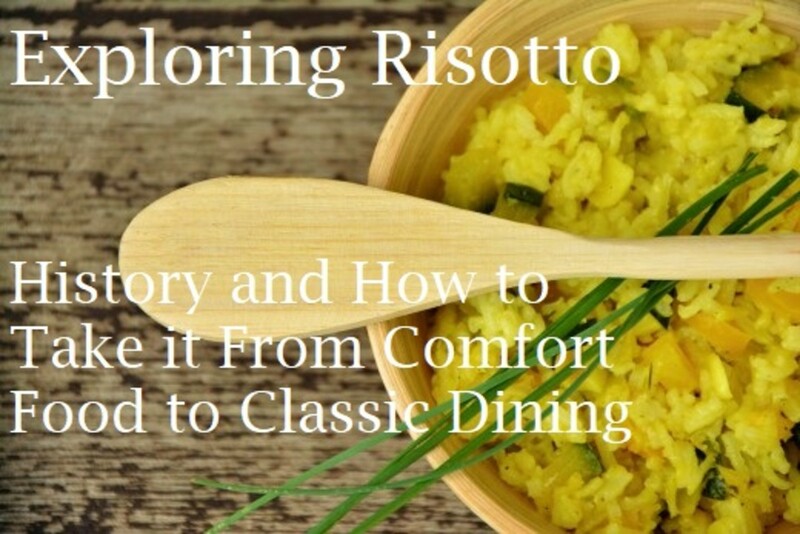 It is the stickiness of those grains which gives risotto its creamy texture. One of my favorite soups is Endive Soup. My Aunt Polly used to make it all the time. Mom still does. It's got teeny tiny meatballs in it and is topped with grated Parmesan cheese. Bravewarrior - I'm guessing it was red cabbage. Not the same thing as you know. If you like the taste of endive or other bitter greens you'd like this one. I don't think I've even eaten radicchio. I know I've had salads with purple greens in them - and love it - but I think it may have been cabbage. Eric - It sounds as though you are willing to try anything (not like our mutual friend billy LOL). I would love to cook a meal for you. Do the goat cheese salad--you won't be disappointed. Very cool article on a most cool plant. My wife likes to use it in her soups. I put a little more than normal in our salads. Stuffing it sounds great and any excuse to buy goat cheese makes sense to me. Dear Bill, you must have been a real challenge for your dear Mother. 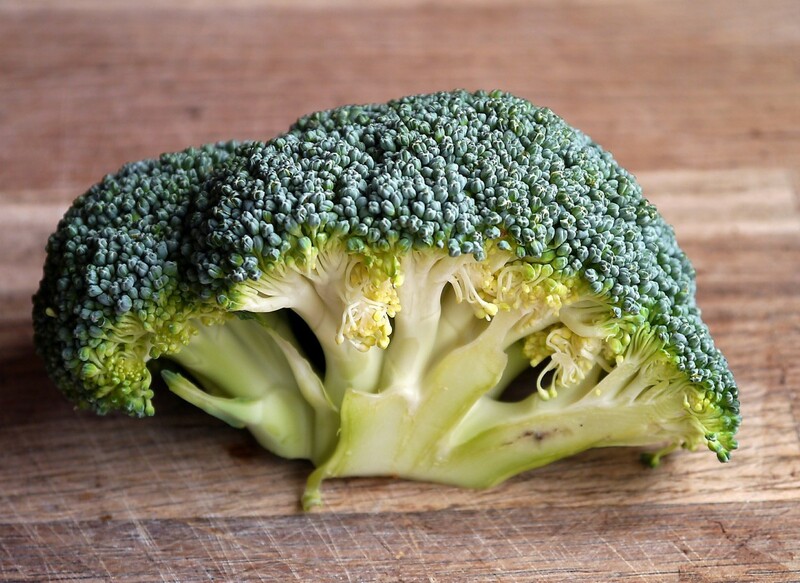 Is there any vegetable that you WILL eat? You said no to the kale, and no to the Brussels sprouts. Please let me know what you love (other than chocolate--and I've already done that one) and I'll create a hub just for you. Flourish - I don't know how much they cost in your area--where I live they tend to be a bit pricey, so radicchio is a special treat. If you happen to use one of these recipes, please let me know. I'd love to get your feedback. Thanks always for stopping by. I appreciate your support and your friendship. Well I'll be. I always thought it was purple cabbage. Never tasted bitter to me but it was just bl need for color and variety in salad.